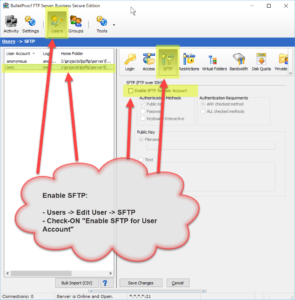 As of version 2018.0.0.40, BulletProof FTP Server supports SFTP aka FTP over SSH in the Secure Edition of the product. 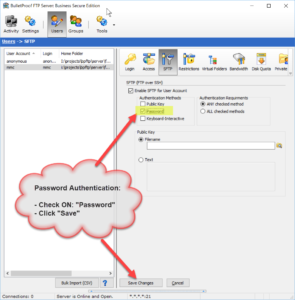 Enabling SFTP for a given User-Account simply requires the toggling of the feature for the user-account, and specifying the authentication method. 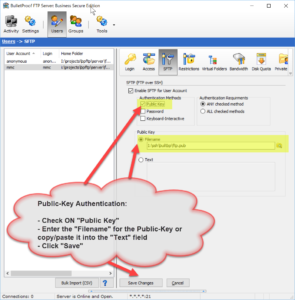 The two methods of authenticating are via Public-Key, Password or both. Optionally, you can specify that the authentication must happen via the keyboard.